We’re famous for our cakes, and for good reason. Our Head Cake Decorator, Mandy Bourgouin, supervises a team of very talented and committed full time decorators. And it doesn’t stop there. We bake everything on the premises by hand and we use only the finest quality ingredients. You have our guarantee it will be fresh and delicious. It’s our old fashioned commitment to quality. After all, people have been baking on this site for nearly 150 years! Our Traditional Birthday Cakes are available in chocolate or white cake, decorated in a floral pattern with buttercream icing. 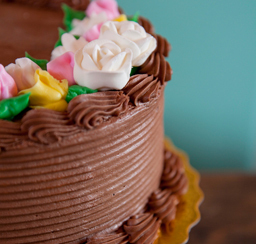 We use a raspberry preserve filling in our 7″ and 9″ sizes and Venetian cream in larger cakes. Bring in or email us your family photos and/or company logos and we will transfer them onto your cake with edible sugar paper. We can also download images as well as hand drawn humorous cartoons for a variety of hobbies, occupations and sports. You can choose from over 100 popular themes for children and adults. 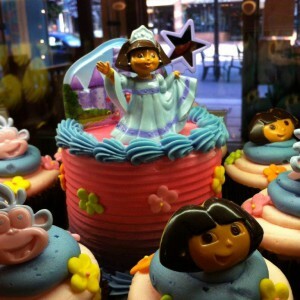 Our Theme Cakes are masterfully airbrushed and adorned with imaginative toy figurine centrepieces. For the little ones, there are classic characters from Disney, to the hottest cartoons on television and iconic comic book heroes. For the grown-ups we have plenty of fun and creative themes from golfing and fishing, to just about every sport and hobby imaginable. Our Theme Cakes are available in chocolate or white cake. We recommend our white buttercream icing for our theme cakes to better showcase the airbrush decorations. Our Theme Cakes are filled with Venetian cream. We use only 100% pure whipping cream! Seasonal fruits artfully arranged on a bed of custard & cake with a sweet pastry crust. Brown sugar glazed bananas & Georgian pecans. Wild blueberries in a gooey brown sugar glaze. Tart raspberries & decadent chocolate. Wild blueberries, strawberries, raspberries & blackberries. 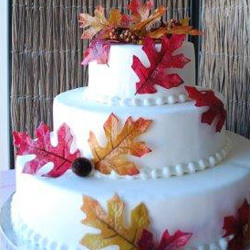 We specialize in creating stunning and delicious wedding cakes and fabulous cascading displays of exquisite cupcakes. From elegant three tier designs to whimsical patterns for informal receptions, our team of skilled cake decorators will handle every detail of your cake including delivery and set up. We invite you to call us and arrange a free consultation with a member of our talented cake decorating team. 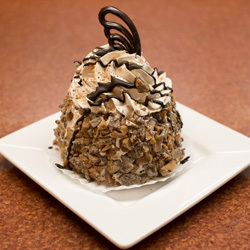 Our decadent Dessert Cakes are to die for! Choose from 10 of the most tempting flavour creations like our signature Strawberry Venetian Truffle, our sinful Skor Torte, and our positively wicked Death by Chocolate. They’re an ideal dessert to serve when family visits, after a game of cards, or just to take along when visiting friends. If it’s a birthday, an office retirement party, or any other special occasion, we will be happy to pop a pure handmade chocolate disc on top and write any message you like. White cake filled with fresh strawberries & Venetian cream, iced in vanilla buttercream with hot fudge truffle poured overtop. Rich chocolate cake filled & topped with a skor toffee mousse. Decadent. Chocolate cake filled with fresh strawberries & chocolate cream, iced in chocolate buttercream with hot fudge truffle poured overtop. A taste of summer! Orange cream cake filled with mandarins & custard. 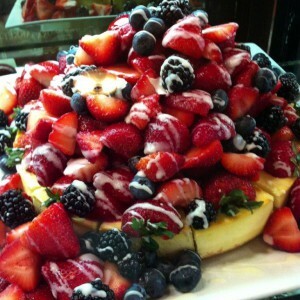 A classic … white cake filled with fresh strawberries & blueberries. Rich chocolate cake filled & topped with deadly fudge icing. 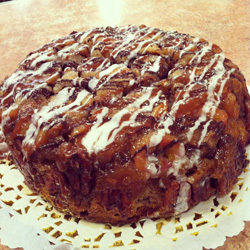 Chocolate cake filled with caramel syrup then covered with fudge & pecans. White cake oozing caramel syrup & topped with a mountain of skor mousse. Topped with our homemade cream cheese icing. Our slow-baked cheesecakes are done in the richer, heavier style of European cheesecakes. Topped with sliced fresh strawberries. A colourful pairing of fresh Ontario blueberries & sweet strawberries. Tart cherry filling tops this summer time favourite. A medley of seasonal fruits on a bed of whip cream. Chocolate cheesecake smothered with pecans & caramel. Chocolate, caramel & fudge brownie chunks. A beautiful mini cake surrounded by 12 themed or flavoured mini cupcakes. 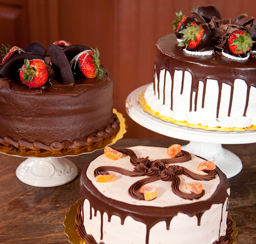 Our wheat-free cakes are made with a blend of potato flour, sugar, skim milk & pure vegetable shortening. Because we have so much airborne flour in our kitchen we don’t claim any of our wheat-free products are gluten-free. 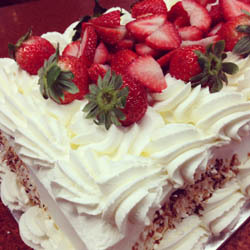 Wheat-free vanilla cake filled with fresh strawberries & venetian cream. Iced in buttercream with a hot melted hazelnut truffle poured over top. Wheat-free vanilla cake filled and topped with fresh blueberries & strawberries. Wheat-free chocolate cake filled and enrobed in a decadent fudge icing. Wheat-free chocolate cake filled with fresh strawberries & chocolate cream. Iced in chocolate buttercream with a hot melted hazelnut truffle poured over top. Our vegan cakes are dairy, egg and animal product free. Vegan vanilla cake filled with fresh strawberries & non-dairy venetian cream. Vanilla iced and garnished with berries. Vegan vanilla cake with a layer of fresh strawberries & blueberries in a non-dairy venetian cream filling. Vanilla iced and garnished with berries. Vegan chocolate cake filled and enrobed in a decadent fudge icing. 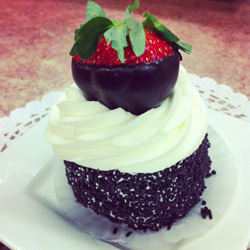 Vegan chocolate cake filled with fresh strawberries & non-dairy chocolate cream. Chocolate iced and garnished with berries. Gift cards are available in any amount you choose, and make a great gift for anyone on your list. Copyright © 2019 Mariposa Market. All rights reserved.